We’d love your help. 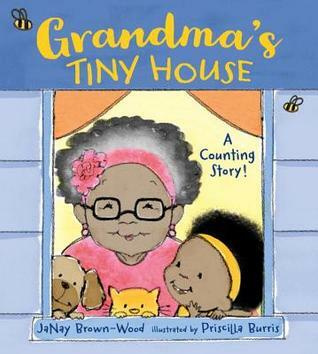 Let us know what’s wrong with this preview of Grandma's Tiny House by Janay Brown-Wood. But when the walls begin to bulge and no-body has space enough to eat, one clever grandchild This sweet, rhyming counting book introduces young readers to numbers one through ﬁfteen as Grandma's family and friends ﬁll her tiny house on Brown Street. Neighbors, aunts, uncles, nieces, nephews, and grandkids crowd into the house and pile it high with treats for a family feast. To ask other readers questions about Grandma's Tiny House, please sign up. Everyone is coming to grandma's house for a meal but will her tiny house hold everyone and the food they bring? Cute counting story about families and meals and making room for all. Would be good for a food/ thanksgiving theme( not directly called a thanksgiving feast in story but two turkeys are cooking!). Really liked this one! I LOVED the illustrations. This was a fun book to count things with my 2 year old. We both liked trying to find the cat and dog on every page. I hollered when I think it was the uncles came to the house with greens and hamhocks, I yelled THESE MY PEOPLE! Beautiful book. Have you ever planned an event and didn’t have enough room for your guests? Oh my, this family put their creativity to the test. When there is a will, there sure is a way. We found this ebook in the abc mouse app library and it’s great! Grandma's Tiny House is the kind of house you want to be in. The story is so full of love, I am so glad I choose it to read to my kids. It makes them think of their own grandma and her tiny house that always manages to cram everyone in. This counting story is firmly set in an African American home with specific details A grandmother welcomes her family, friends, and neighbors into her home for a wonderful feast, and everyone brings food to share. Cheerful rhymes mark the arrival of different guests. "THREE neighbors knock on the brown wooden door, with FOUR pots of hot greens and ham hocks galore." As more folks arrive, the house quickly fills. Where is everyone going to go? Aunties, cousins, grandkids -- it's quite a houseful. Brown-Wood, JaNay. Grandma’s Tiny House, PICTURE BOOK. Charlesbridge, 2017. $16.99. As Grandma’s family has grown, her small house has stayed the same size. With family and friends coming over for dinner, will they all fit inside? Eventually the house bulges so big with food and people that one cute granddaughter suggests that dinner should be served outside to solve their problem. Each group of visitors is counted up starting with one to fifteen. They all bring a dish to eat as well. This is a Brown-Wood, JaNay. Grandma’s Tiny House, PICTURE BOOK. Charlesbridge, 2017. $16.99. This is a great counting story that shows loves of family and friends. * Book prominently features diverse characters: Yes, an African American grandmother and her very large family, plus a few ethnically diverse friends. * Book would work for a preschooler storytime: a bit long for the wiggly toddlers, would work better with preschoolers. There are only a couple lines per page and the pictures are large and countable, if you want to add in some interactiveness. 10/24/2017 ** Large family? Lots of friends? Small house? Where do you take your gathering? Why the backyard of course. This smoothly rhyming counting book portrays a family gathering for a delicious feast. Another book in the category of humans gathering for family traditions - humans who happen to be people of color. I look forward to sharing the story and illustrations with my elementary listeners and readers. Source: The 2017 Top 20 Best in Rhyme List! Watch for the Top 10 List mid-November. h 10/24/2017 ** Large family? Lots of friends? Small house? Where do you take your gathering? Why the backyard of course. This smoothly rhyming counting book portrays a family gathering for a delicious feast. Much like Feast for 10, this book tells the story of many people coming together at Grandma's house for a large dinner. Counting to 15, friends, uncles, aunts, nieces, and nephews all bring delicious food to share, including turkeys, collard greens, honeydew melons, and sweet potato pies. Readers can almost smell the aromas wafting from the colorful pages. A diverse set of characters share in this delicious feast that happens in Grandma's tiny house in the city. A story about Grandma's small house and the people who come to visit and share a dinner with her bringing their favorites to her tiny house on Brown Street. The little girl helps Grandma with a place to have everyone sit and eat the foods they have brought to share. All characters have a multi cultural look of all families coming together in the neighborhood not just Grandma's children and grand children. This is the author of Imani's Moon. Read that one, too. Cuuuuuuuute. In this story, Grandma's house is the setting for a big family get-together, but how can they all possibly fit in her tiny little house? Through counting and rhyming text, the story unfolds with more and more family showing up and bringing food to Grandma's house, that by the end, they are squeezed in so tight, the littlest granddaughter has to come up with a plan. This review has been hidden because it contains spoilers. To view it, click here. Chicago Public Library Best Picture Books of 2017. I thought it was OK, but rhyming seemed forced, illustrations didn't do it for me, and foods seemed stereotyped. Maybe the problem was the story to me felt set in an eastern city and it wasn't until I read the jacket that I realized both the author and Illustrator were from CA. This is a simple counting book that celebrates the joy of family as one very large family attempts to have dinner in one very small house! How will everyone fit? Luckily, one clever kid saves the day. Veg*n Parents Note: Although plant-based foods like honeydew and sweet potatoes get their own pages, roast turkeys and ham hocks are also name-checked in this counting story. A small format book with a big story inside. Grandma's family is coming over, and they pack her house full of nieces and nephews, aunts and uncles, cousins and grandkids, and lots and lots of food. They're just not sure everyone will fit! In this counting book, a large family gathers together for a meal at Grandma's tiny house. Family and friends are counted as they come through the door. They are not sure how they will fit everyone, but a small girl comes up with a solution. It's a lovely story about family, food and numbers. Love this book! Kind of reminds me of my own family gatherings where Grandma's house would be busting at the seems, but everyone is laughing and having fun. It is a counting book, but really it's just a fun family having a huge party book. Would be a fun Thanksgiving storytime book. This is a wonderful book about family, counting, and celebrating together. I love how the illustrations capture the mood of each scene. This is a favorite and a MUST ADD to your children's book collection. Such a sweet book about the love of family, friends and neighbors and LOTS of good food! I recommend it to anyone who's looking for a fun counting book and a great story. It's just full of the greatest blessing in life. . .family! This quick read will make your day! A rhyming counting book in which friends and family in large numbers are gathering for dinner at Grandma's house. There's plenty of food, but not enough room so they move their dinner outside instead. Fun read aloud with digital artwork. PreK-2. Granma's tiny house is too small to fit all of her family for dinner! What are they going to do? This works as a great counting, family and food book. I love the illustrations with the crayon-soft edges. This would be fantastic for a toddler or preschool read aloud. A large family has decided to have a big feast at their grandmother's house. However, Grandma's house is rather small, so everyone may not be able to fit. This story does a great job expressing family while incorporating a counting lesson for children in a fun way. Really cute book! It's a rhyming story with counting in it! It's clever the way it was written and the illustrations are nice too, very colorful and full of life. Everyone is coming to grandma's for a celebration. Can they all fit? Super cute. preschool and up. I lvoe the joy and ending.